This was one of the best educational experiences in my life of two Master’s degrees and a partially completed Doctoral degree. Fantastic and accessible presentation of biomechanics. Please come to my school and fire the biomechanics instructor. How does online order processing work? Why does my credit card account show more than one pending charge? Somehow I ended up with more than one order. How do I cancel it? I got my order and it is wrong or damaged. What do I do? My DVD isn't playing sound across both speakers. Is something wrong with it? My DVD isn't playing right in some players. Is something wrong with the disc? Can I buy Starting Strength 1st ed and 2nd ed? What is the estimated delivery time for international orders? Will you mark the package as "gift" to limit taxes imposed for import? What is the total that will be marked on the package? What other sources are there for international customers? What shipping methods are available? How long do they take? What shipping method do you recommend? What are the benefits of attending a Starting Strength Seminar? Who attends? Where can I find the course description and requirements for passing the course? Is it eligible for Continuing Education credit (CE?CEC/CEU)? Personal Trainer Insurance? What are the benefits of becoming a Starting Strength Coach? What are the differences between the Starting Strength Seminar and the Starting Strength Training Camps? Can my order be sent as a gift? How does online order processing work? Why is my credit / bank account showing more than one pending charge? Unlike in-person transactions, online sales occur in two separate steps. When you place an order using a credit card, your information is submitted for an authorization. If your card issuer approves the authorization - confirming that your information matches and that there is sufficient credit - they place a hold/pending charge for that amount on your account record. Warning: if you submit an order multiple times, your card issuer or bank may accept multiple authorizations. This includes when you put in incorrect information (missing or wrong card verification number, a billing address that does not match your record with your card issuer, etc) that prevents an actual order from being completed. Your bank's policy determines how long the holds they issued remain in place. Orders are only captured to create a final charge on your account (converting the hold/pending to a charge) after orders are completed. This happens as orders are processed by shipping the order and the authorizations are captured. Note: This second step means that any duplicate authorizations are not charged. They ONLY show as hold/pending charges on your account. They will disappear from your account according to the policy of your card issuer or bank, but usually within 5 business days. Essentially, you are seeing their record as they keep track of your available funds to make sure that you do not go over limit. A phone number provides a way for us to quickly contact you if there is a problem with an order. Phone numbers can be important for international orders as they provide a way that you can be reached if there is a problem with your package at Customs or during delivery. Please note that some credit card issuers require a correct phone number for any transaction approval. Contact customer service with your request. Orders can be cancelled if they have not already been shipped. Please note: there is no need to cancel orders made by check/money order since the order is not complete unless we receive payment. We periodically clear out old, unpaid check/money order orders when they expire. We verify apparent duplicate orders before sending them out. Look for our email or phone call. Or you can contact customer service to make us aware of the problem if we haven't already contacted you. The first thing you should do is show any damage to the shipper for documentation. After that, contact us as soon as possible and we'll get things straightened out. The DVD is recorded as two separate audio tracks: voice and music. You may have to adjust your settings in some stereo systems to ensure that they are both being played. DVD players and formats vary. There are potential incompatibility issues, particularly when trying to play DVDs in computers and game players. Symptoms are freezing and not playing all or part of the disc. Why doesn't disc X work in player Y? Why does playback sometimes freeze for a second? Why do I have a problem playing DVDs on my computer? We do not have any for sale at this time. There are no new copies of either edition available, though some may claim them as "new" when reselling the used, old copies. We don't actually recommend that you buy them as Starting Strength, 3rd edition is much better. There are many possible reasons for rejection of a good credit card and the trigger depends on the requirements of the card issuer and payment processor. Billing phone is incorrect or invalid. If something is still going crazy-wrong, please contact us and we'll try to find a way around the problem. International orders will sometimes have very specific problems with address matching. Please contact us for a workaround if you are having difficulty with an international order. These can sometimes be very tricky. We ship orders by the next business day after the order is made Monday through Friday. Shipping notices are sent to the email address entered during order placement. Notices are sent directly from stamps.com. If you do not receive the email contact us and we will resend the information. 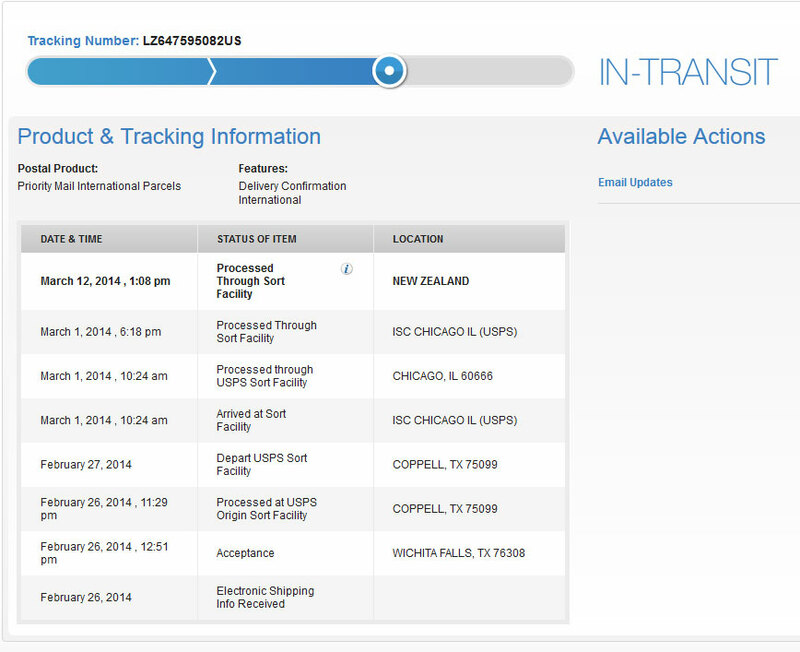 Yes, we are currently shipping products to international addresses that accept USPS International Mail. Please note: if your country is not listed as an option you must contact customer service with the specific items you wish to order. We will then check to see what specific restrictions are in place and whether or not we will be able to ship the products. Shipping terms are quite country specific. Shipping policies change. Some countries are not eligible for any shipment because of fraud/theft issues (eg Nigeria). Canada: Canadian addresses must contain the province. These are listed in the drop down menu on the address screen. Other countries: After you select your country on the country drop down menu, an open box for state/province will be shown. Fill in the information for your state/region/province/shire in the box below. If you do not use these in your postal system, please enter "none". Likewise, if your country does not use postal codes, please enter "none". Shipping rates are determined by the US POSTAL SERVICE based on item weight, distance, and international agreements. The cost is determined in real time and reflects the best price that is available. Orders are shipped by US Priority Mail or as First Class Packages. You will be given options that show the rates for each service that is available during checkout. First-Class International Package Service: Available for shipments under 4 pounds. Rates are calculated based on destination and package weight. Priority Mail International Service: Available for up to 70 lb shipments. Price is calculated by the USPS and varies with weight and destination. The USPS also has flat-rate options which can yield less costs for heavier orders. Priority Service is more reliable and quicker than First-Class International Service. Poster shipping: Posters are shipped separately from other items in an order. They are considered separately in calculating shipping charges. They are shipped via First-Class International Package Service. More than one poster can be shipped in the same order. The USPS lists "6-10 business days" as the ESTIMATED time until delivery for Priority International Service. Delivery time for First-Class International is listed as "delivery varies by destination." Actual shipping time varies by country, region, and season. You can expect service to be slower during the holiday season (mid-November through mid-January) due to dramatic increases in mail volume. Please note that USPS.com updates its order tracking at specific points and not after the package has left the US - any updates after this depend on your country (see below). The USPS tracking number can often be used for package identification with your country's mail service, but generally not through online tracking. Please contact your postal service directly for information. "Electronic shipping info received" -- Package is shipped, customer shippping confirmation is emailed, and sale is completed. "Acceptance" -- verification by the USPS that they have custody of the package. Intermediate "Processed at/arrived at/depart Sort Facilities" notes are made as the package moves between the shipment point and end of US processing. These may be entirely absent when packages are swiftly moved. 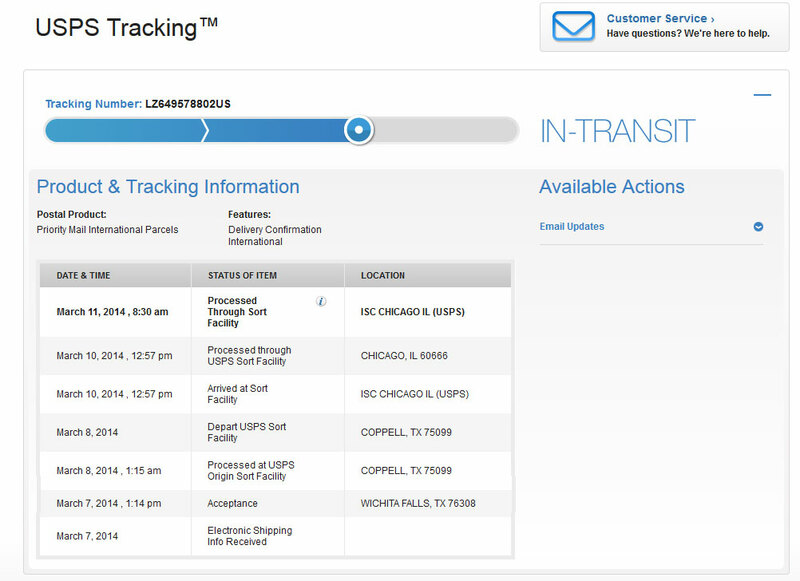 "Processed through Sort Facility" AND Location = ISC CHIGAGO IL" -- This status shows the time and location that package left the US for most types of mail. An alternate site is Jamaica, NY, used for First Class International Packages. Once your package has left the US, these updates depend entirely on your country's mail service -- often they are not provided until *after* the package is delivered. International mail is out of the US within days (4 or less unless weather interferes). Any package with a labeling or postage problem is returned, not held. 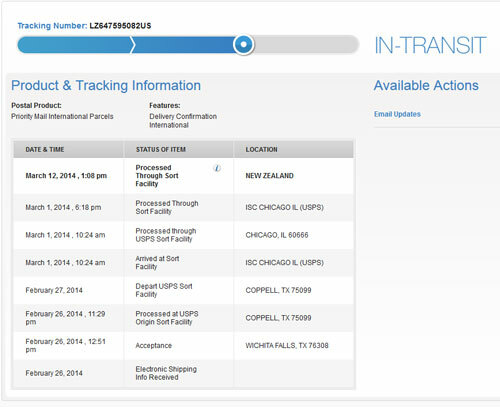 This means that typical records during package transit will show current activity up to the point they leave the US. What next? This depends on your country's Customs Office and local delivery. Customs may delay, hold, or inspect mail. They may directly assess taxes and other fees. Your in-country mail delivery service may collect for the Customs office or have other requirements before your package can be delivered. Packages are often held by local post offices. If there are taxes/fees, find out how notification and processing for any taxes due will occur. Your package might be held up because you have missed a notice you were not expecting. Contact your local postman/post office to check for held packages, get an idea of how long your country's Customs processing might take, and make inquiries. *IF* your country uses the USPS tracking number in their system, your postman may be able to locate the package within the Customs and/or local mail service and let you know when to expect it. No. Don't bother asking. All importers are responsible for import and other taxes, as well as Customs fees. If you have any question about taxes & fees charged by your country, search for the tax laws that apply to you online, or make inquiries at your local tax office. Totals are marked in US Dollars. The actual merchandise cost and the shipping costs are broken down for your Customs office. If you want to see how those numbers translate for your country, please check the costs using a currency converter. You can find these on Google. Here's the link to one on Yahoo: Yahoo Currency Converter. The options below may work out to a better choice for you depending on other items you are purchasing, shipping considerations and/or your tax liability. Standard Shipping (available for books and DVDs only) is US Postal service Media Mail, 5-21 days, 5-10 is typical, 5 or less is common if the shipping address is near our facility. If you want it "fast", choose Priority Mail. If time is not a big factor, choose Standard Shipping = Media Mail or First Class for books or the DVD, respectively. Priority Mail is always recommended for Alaska and Hawaii. Costs are the same as for domestic mail. Delivery time depends mostly on the military mail service. SELECT "United States" as the ship country for these addresses as they are treated by the Postal Service as US mail. The pattern APO, AE 99999 corresponds to city, state, zip code. IMPORTANT: You must provide the correct information as we ship to the address you provide - as for any NOT LISTED in the drop down, you must choose "NOT LISTED" and actually fill in the information by typing it in. The seminar provides theoretical and practical instruction for the five basic barbell lifts. All attendees have the opportunity to learn the lifting model for each lift and practice it as both an athlete and a coach over the weekend. There is also plenty of time to interact with Mark Rippetoe and the coaching staff to ensure questions and special concerns regarding training are addressed. Typically ~1/2 of attendees coach trainees and 1/2 come purely for improvement of their own lifting. Experience levels vary widely across both groups. Those attending to improve their coaching include attendees just beginning to learn and practice strength coaching to those with decades of experience. Lifters range from those who have not ever performed the lifts to advanced-level lifters with many years of training under the bar. For feedback from previous attendees please see the Starting Strength Seminar Testimonials on this site or discussions on the Starting Strength Events Forum. The basic description is found on the Starting Strength store page. More detailed information can be found on the Starting Strength Seminars Course Information Page on this site. Is it eligible for Continuing Education Credit (CE/CEC/CEU) & Personal Trainer Insurance? CE: Some organizations have credited CEUs for attendance at the Starting Strength Seminar. Please check with your certifying body to determine the requirements for receiving credit for this course. We will assist you by providing the course description, syllabus and instructor information as required for submission. Insurance: The Starting Strength Seminar qualifies the attendee for personal trainer insurance with Sports & Fitness Insurance. Access to the Starting Strength Coaches Forum, a private forum for professional interaction hosted on StartingStrength.com. Each Starting Strength Seminar presents a much more in-depth theoretical background, addresses each of the basic lifts, provides attendees the opportunity to solidfy learning by practicing coaching the lifts, and is led by Mark Rippetoe. The Starting Strength Training Camps are short events focusing on 1-2 of the lifts with an emphasis on their performance. Some theortical information is given, but the focus is on improving lifter performance. Training Camps are led by experienced, staff-level Starting Strength Coaches. For more information, please refer to the description accompanying each listed training camp event. Special discounts will be posted from time to time. Also see "shipping savings" below. If you are interested in a one time discount for a big order that qualifies as wholesale please contact us and we will work with you to get you the best price possible. Please see our wholesale order page. We offer free standard shipping (Media Mail) for US BOOK orders where the total is greater than $29.95 (like Amazon's "Super-saver" option but better as they've gone up to a $35 threshold). For international orders: currently there are limited options for economical shipping. If we find information about better shipping options, we will work on setting them up for you. Yes (but we don't gift wrap!). We will make sure to not include price information on any gift orders. Please make the request when the order is placed by putting the request in the "Special Instructions" box that appears under the shipping address entry lines during the ordering process. If you have already placed your order, please contact us with the request as soon as possible. Retail sales are FOB Shipping Point : buyer pays shipping, goods are sold and belong to buyer at shipment, buyer posts claims for damage or loss during shipment. Standard wholesale sales within the US are FOB Shipping Point as above, except seller pays shipping by FedEx Ground. Non-standard wholesale and foreign wholesale are FOB Shipping Point with shipping paid by the buyer. Orders are shipped after they are completed with payment. Orders initiated by check or money order expire in 30 days if they remain incomplete. Items may be returned if arranged within 4 days of receipt through customer service. Upon return of the item(s) in new condition, the purchase price less the credit processsing and 10% restocking fee will be credited to the customer's credit account or mailed as check (as applicable). Items returned due to mail refusal or invalid address will be subject to the same deductions plus any return shipping charges and the full amount of the cost of initial shipment if the item was shipped at no added cost. A buyer may elect instead to pay for the item to be reshipped. Event purchases are not refundable. Tickets may be transfered to other parties by notice of the original purchaser. Purchase agreements approved during the purchase of specific events take precedent over this general policy. Please see specific event terms in Terms and Conditions. Sales Agreements are required for ticket purchase and are also found associated with each item on its store page.